Learn how to improve your grant applications in this three-hour interactive grant writing workshop. Developing strong and effective grant writing skills is essential for artists of all disciplines, collectives and organizations. Explore turning an idea into a strong grant application, the basics of project management, building a comprehensive budget, and more. We invite organizations and individual artists that are interested in deepening their understanding of grant writing to join us! 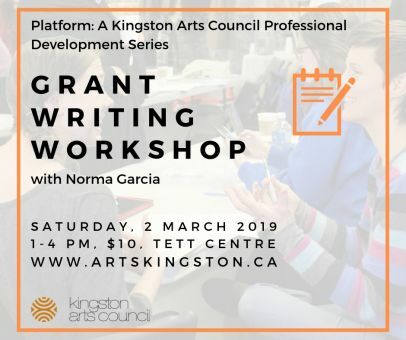 The Kingston Arts Council staff will be available to answer questions about the City of Kingston Arts Fund and the Nan Yeomans Grant for Artistic Development after the workshop. Registration is required. To reserve your spot, email info@artskingston.ca or register on Eventbrite. The Tett Centre is an accessible venue. Please let us know about your accessibility needs so we can accommodate you. Email Diana Gore, Administrative and Communications Officer at diana@artskingston.ca. Norma Garcia is an arts administrator, grants consultant, and independent filmmaker. Her previous work experience includes serving as a program coordinator for the National Film Board of Canada, as a senior grants assistant for the Toronto Arts Council, and as a content coordinator for BravoFACT – a division of Bell Media. Currently, as part of the Toronto Arts Foundation’s team, Norma is responsible for the coordination of mentorship activities to benefit independent artists, and for digital content development; she is also working in the post-production phase of a short film she produced and directed, having successfully secured funding from the Ontario Arts Council for it’s creation.